yo fellow vampys(or werewolves)! candice here,13 female and...err yeah. ive been a vampire last year but in anime form,haha..
haha! welcome to the eboards, dude. i'm Cathrel Cullen, obviously. LULZ. pls, be an active user too.. we need it. active users, i mean. BE ACTIVE! BE ACTIVE! BE ACTIVE! BE ACTIVE! BE ACTIVE! BE ACTIVE! BE ACTIVE! BE ACTIVE! BE ACTIVE! yeah yeah yeah.. im gonna be active big sis's and bros *just translate that in dialect" just gonna finish eclipse wish me luck! vampy_princess505 wrote: yeah yeah yeah.. im gonna be active big sis's and bros *just translate that in dialect" just gonna finish eclipse wish me luck! man... eclipse... u really should.. you know.. well tell us what you think of it. oh they did! married in no time i mean. LOL. in breaking dawn. in chapter one. Ooops. Spolier! LULZ. it's muh job man! anyways, there will be an ARMY OF JAKE HATERS IN NO TIME! but there already is anyways..
cathrelLOVESedward wrote: LULZ. it's muh job man! w8 w8 w8.... there's how many of us now? well, there;s me, you, nonie, jobel, joanna, andrea, megan, loulaine, vina, candy, yeyee and well almost everyone who read the books in our room! LOL/ boys just don't undertsnad us. no matter how hard we try to explain. they just dont understand. Has Carlo even read Twilight Series? They only say that coz they want to oppose us. Boys are always like that. EDWARD is HOTTER, SMARTER and BETTER! 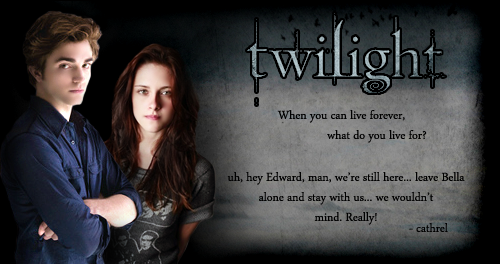 c'mon, EDWARD CULLEN is ze BEST since 1901!!!!! well,boys will always be boys ya know..